My vision and goal for this shoot was to create something beautiful while enhancing and showcasing the natural beauty of Arizona. I thought Horseshoe Bend was the perfect location for a shoot that was not too extravagant and over-the-top but just naturally organic and beautiful. 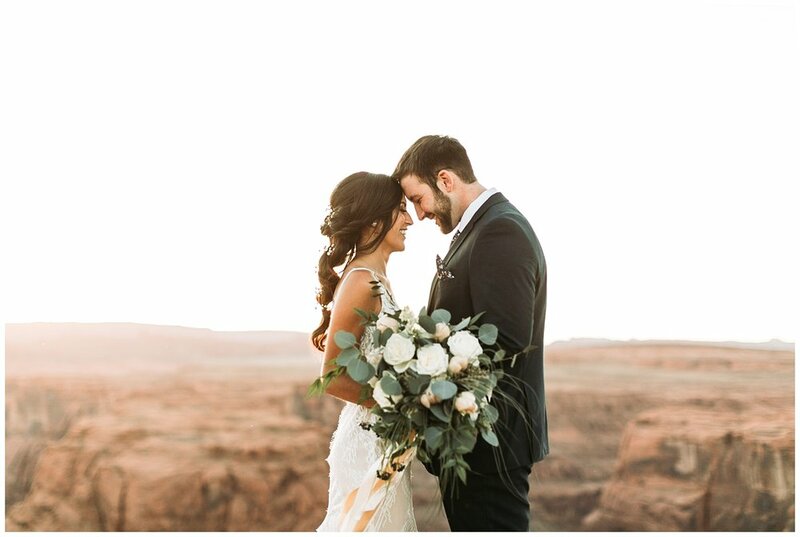 This shoot came to life with these two and their willingness to hike up to the actual bend barefoot and in their wedding attire. I wanted her dress and hair/makeup look to be natural with touches of bohemian vibes. Let me tell you that this shoot does not look as glamorous as it seems! Picture like 75 tourists filling up the entire edge of the bend posing for photos, asking to take photos of your couple, and 100mph winds that made your nose feel like an ice cube. Yeah. That happened. We all did our best to work around the tourists and were patient with the wind to make sure hair wasn't all over the place. Definitely a challenge but 100% worth it!